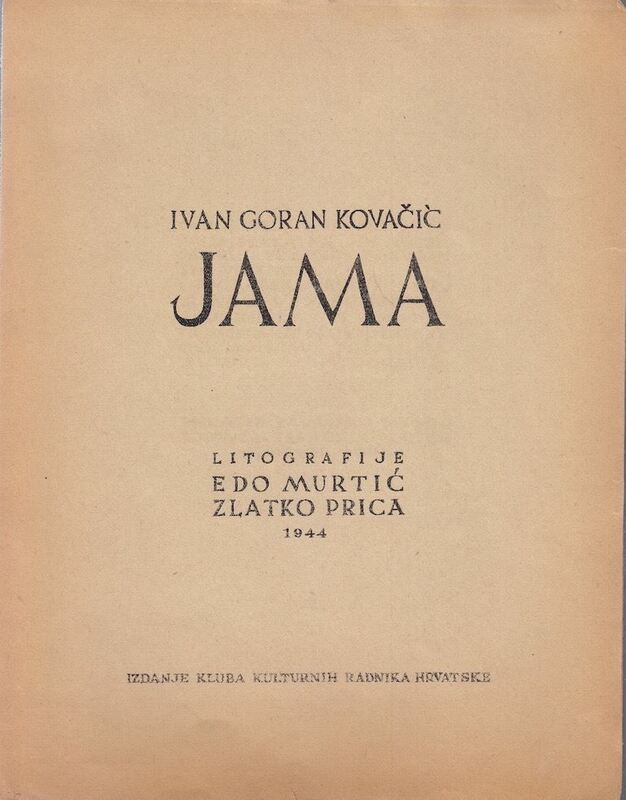 Ivan Goran Kovačić: Jama. 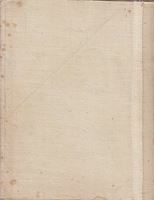 Poetsko-grafička mapa. Litografija Ede Murtića i Zlatka Pice. 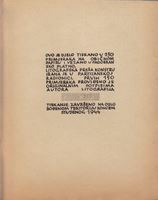 Uvezano u padobransko platno. 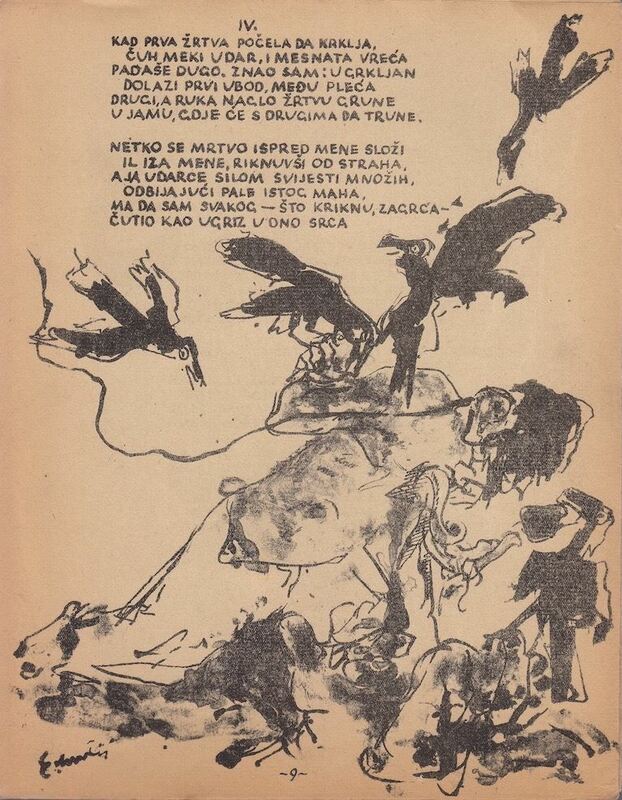 Tiskano u 250 primjeraka, ratne 1944., godinu dana nakon pjesnikove tragične smrti. Objavljena je u Topuskom, gdje je 1944. održan Kongres kulturnih radnika Hrvatske na oslobođenom teritoriju, a Edo Murtić mape je poslao Theodoru Rooseveltu, Winstonu Churchillu, Staljinu i Pablu Picassu. U vrlo korektnom antikvarnom stanju. Manji tragovi vremena na platnu. Istovjetnim platnom, u vremenu nastanka, manja zakrpa na gornjem lijevom dijelu naslovnice. Platno na naslovnici, na donjem vodoravnom dijelu mao savijeno. Kompletna. 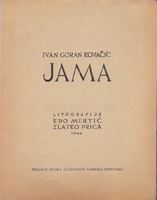 Ivan Goran Kovačić (21 March 1913 - 13 July 1943) was a prominent Yugoslav poet and writer of the 20th century. He was born in Lukovdol (part of Vrbovsko), a town in Gorski Kotar, to Croatian father Ivan and Jewish mother Ruža (née Klein). His middle name Goran stems from that ("goran" meaning "hill-man"). During World War II, he joined the Partisan forces. 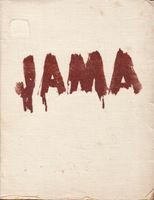 His best known work is "Jama" (The Pit), which ranks among the most celebrated Yugoslav poems ever written. 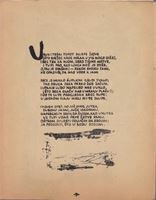 He penned it during the war, while in service near the city of Livno, Bosnia and Herzegovina. 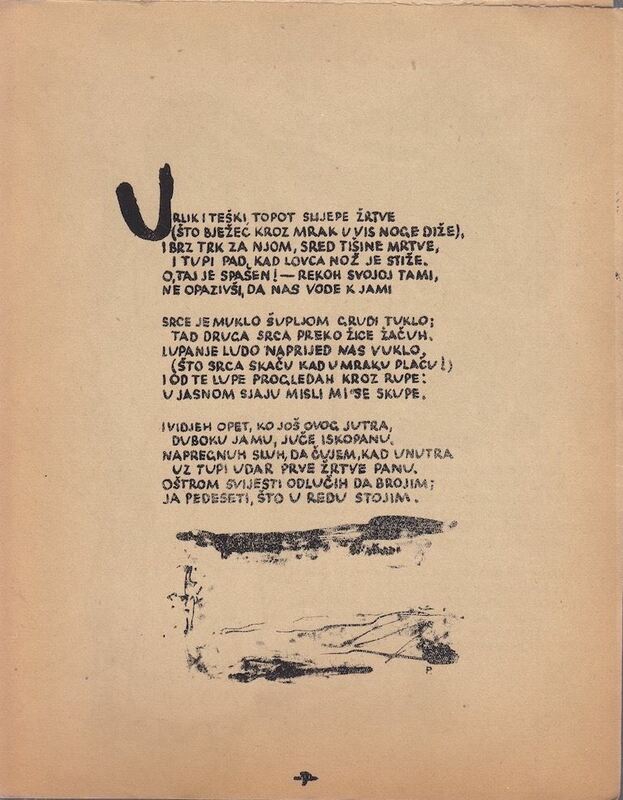 The poem was written out of intellectual and ethical responsibility that condemns fascist atrocities committed by the Ustaše. 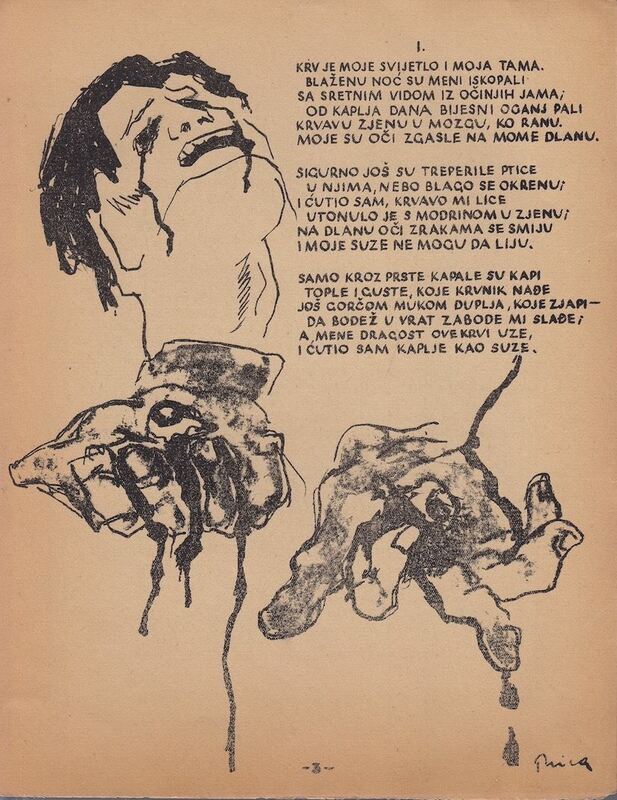 Ivan Goran Kovačić was killed by Chetnik troops in an east-Bosnian village of Vrbica near Foča on July 13 1943.His work is an example of anti-war poetry with messages against torture, mass murders and war crimes. 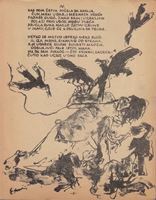 The Croatian painter Edo Murtic (1921-2005) was an active member of the armed resistance against the German occupation in 1944. Before the war he painted representational. 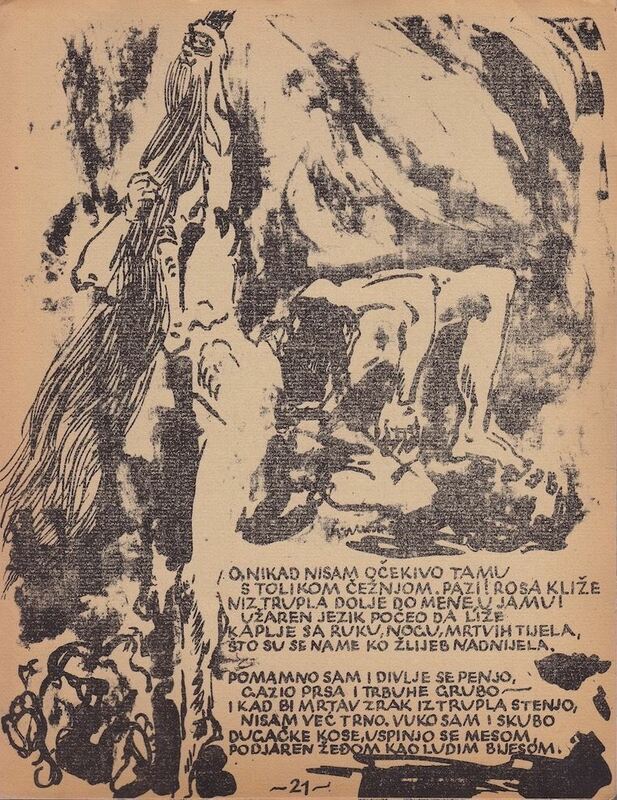 After the end of the war, he was already a famous artist in Yugoslavia, but also beyond its borders. His style has undergone a rich spiritual maturation, gradually and without a break, from his figurative paintings of the 1940s and 1950s to his current Lyrical Abstract Expressionism. Edo Murtić has had over one hundred and fifty independent exibitions and taken part in about three hundred collective exhibitions in all the continents. His works are featured in the leading private and public collections round the world. He has designed and made numbers of theatrical sets, murals and mosaics. He lives and works in Zagreb and Vrsar. 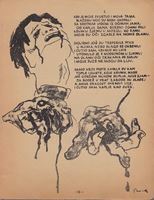 Zlatko Prica (1916.-2003. ), Croatian painter and graphic artist. Accomplished his own expressive two-dimensional style with emphasizes on strong drawings, concise form, pure and strong colors.